There seems to be a deluge of questions by folks with rep of 1-10. Many of these questions are "homework" or questions that are annoying to me "please read my 500 line script and tell me whats wrong with it" Is there any way to filter questions by reputation? There are also a lot of new users with good questions who haven't had the chance to gain rep yet. We already have closing, downvoting, flagging, deleting and editing. Those are in place to clear up spam, unclear, offensive, closed and poorly-worded questions, respectively. Votes, flags and closing is a much better indication of a question's worth than the reputation of the one who asked it. I can name a lot of high-rep users who consistently ask bad questions, and I've seen lots of good questions asked by brand new users. A filter won't solve anything. This is one of the most toxic ideas I've witnessed here. 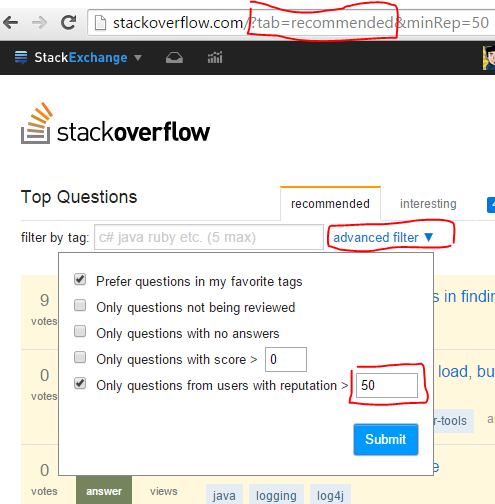 Stack Exchange is designed to be a place where anyone can meaningfully contribute to the site with zero buy-in. You can, should you choose to, create a question without even logging in (on most sites). We want this behaviour, because it allows the generation of all the rich content we have. We want to set the bar to entry to be quite low, because once a user arrives and finds it welcoming, we want them to stay. Remember, Low rep does not equal low skill! Those are just a few. And I, for one, would really want to read what they have to say, even though they have no reputation on Stack Overflow. There are millions of other people out there with zero reputation, and I think the assumption that their low reputation means that they have no value is offensive. If a significant number of the people who actually answer questions were to do this, it would seriously impact the number of new people coming to SO to ask questions. If people don't get their questions answered, they won't be back. Overall, I think it would degrade the utility of SO in unacceptable ways. This request was declined for a good reason, offering a bounty won't change it. These sites are not about people. Judge the content, not the person who posted it. Filtering by reputation makes absolutely no sense, there are bad questions asked by users with 500 of reputation, and great questions asked by new users every day. Such thing would only lead to make it harder for new people to get answers, even if their questions are great. It's already hard enough to get attention, with your question staying on front page for about 20 minutes max, don't increase the problem. Elitism is the plague of all computer related help sites, and I'm pretty sure we don't want that on the trilogy. This is for Unanswered questions from users with reputation >= 100. It should be easy to modify to suit your tastes. New people will find it harder to "get into" the community, leading to a clique. Existing users will push even harder to boost their reputation, which may create undesirable results (e.g. questions only aimed at rep-boosting). Don't know if it's really hidden. but adding /?tab=recommended will give you this filter option. I would like to have this feature both for questions and answers. Maybe for questions it should be part of a "complex" search function while for answers it could be enabled only for questions that have more that X answers. Not the answer you're looking for? Browse other questions tagged feature-request status-declined reputation search filtering . Can I search question by user reputation? Is there a way to filter questions based on the reputation of the asker? Can we get the asker on the front page instead the most recent changer?